It must be Glove. . .
Gloves. The difference between having toasty warm fingers and frozen numb ones. Between being dry and comfortable and being wet and miserable. And let's face it, between wiping your brow with relief that you got away with it and having someone wipe your bum while your hands heal. Gloves, folks, are really important. Probably the second most important thing you'll wear after your helmet. They're also notoriously difficult to get right. 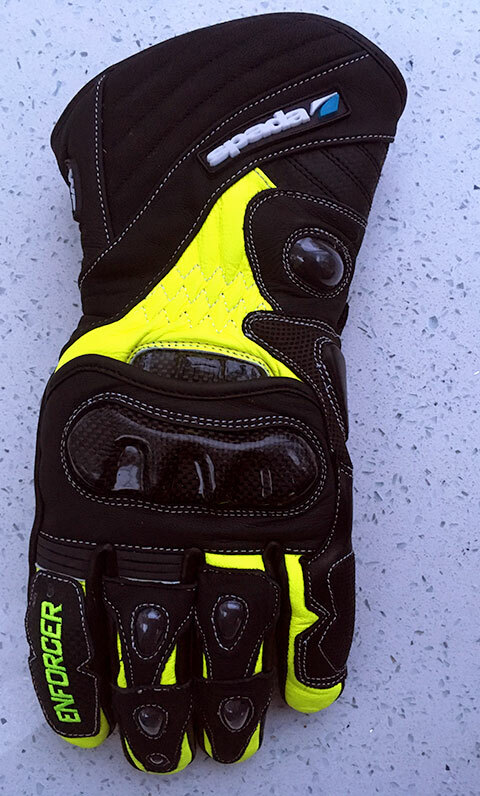 Your summer gloves give you delicacy of touch, the feel through your hands that lets you know exactly what your bike is doing as it happens. But if it rains or the mercury starts to drop then you end up cold, wet, and miserable. And that delicate feel gets lost in a haze of numbness and pins and needles. No fun at all. Your winter gloves, of course, are toasty warm and waterproof. or at least they should be. But they have all the feel and finesse of a pair of boxing gloves, and working the switchgear can seem like you're doing it through a duvet. That's where the Spada Enforcer comes in. It's not a full blown winter glove, and it's not an out and out summer glove either. It's a happy compromise - essentially an all season glove with a nice sporty bias. So let's start off with a good look at them. They're a mixture of Cordura (or something similar) and leather, with a reassuringly strong looking PU moulded knuckle protector. This particular pair is a fetching shade of dayglo yellow and black, though other colours are available. 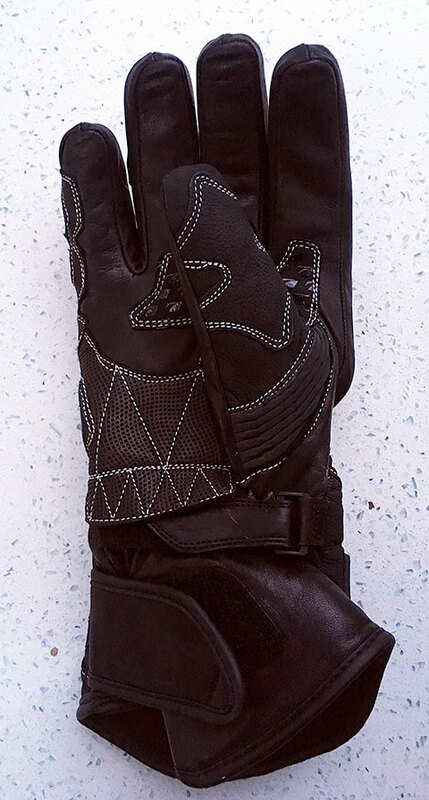 The palm is leather and has reinforcement panels in the right places. There are individual bits of armour on the backs of the fingers and protecting that little bit of your forearm that protrudes just above the wrist (and bloody smarts when it gets chipped). Wrist and cuff fastenings again look as though they mean business. Putting the gloves on it immediately becomes obvious that they are very well made indeed. It also becomes obvious that they are really quite warm - if anything they're too much for autumn and spring, and will really work through most of the winter without a problem. Riding emphasises that - while it rained bucketloads, my hands stayed absolutely dry but were bordering on being uncomfortably warm in the unseasonably mild weather we're currently enjoying. One thing that I was pleased about though. I'd heard rumours that these gloves didn't breathe and that overheating was a real issue. Well, I can confirm that isn't the case - while I was certainly quite warm there wasn't a buildup of clamminess or sweat and the gloves remained both usable and sensibly dry. I'm dedicated to this site and to informing you about products and stuff, but but so dedicated that I'm prepared to crash-test kit for you. I will say that my knuckle-bash test demonstrated that the armour and padding both work well and my attempts to pull straps off and split stitches failed. Which is good really because I plan to use these gloves through the winter. Bottom line? There are probably more stylish gloves out there, probably slightly better all-weather gloves (the sadly discontinued Predator, also from Spada, is my all-time favourite) and probably gloves that offer slightly more ultimate protection. But the fact that I'm choosing to use these myself, and the fact that you can pick a pair up for under £70 without difficulty should tell you that there are very, very few better gloves at this price. I'd recommend them, without hesitation.